commented on "An exhibition honouring Sir Keith Holyoake, former Prime Minister and Governor General, and a founding member of the New Zealand ..."
Kiwi Keith - Portrait of a P.M.
An exhibition honouring Sir Keith Holyoake, former Prime Minister and Governor General, and a founding member of the New Zealand National Party, was launched at the Nelson Provincial Museum by the Prime Minister John Key on 9 August 2013. 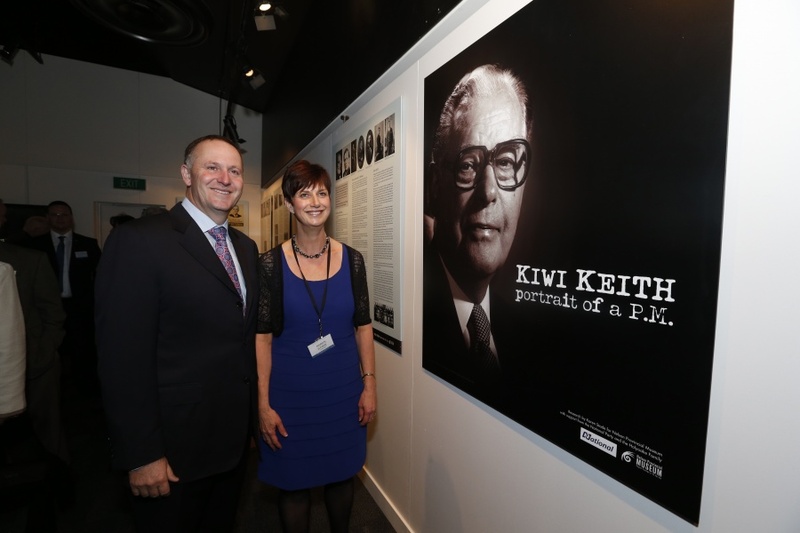 Kiwi Keith, Portrait of a P.M. is curated by Nelson historian Karen Stade, seen here with Mr Key, and was opened at the start of the National Party's annual conference in the city The exhibition is supported by the National Party and members of the Holyoake family, many of whom travelled to Nelson for the launch. Sir Keith was raised in Riwaka and was Motueka MP in the 1930s . He went on to serve as MP for Pahiatua in the North Island, becoming leader of the National Party for 15 years and Prime Minister for 12 years. He was a very effective Minister of Agriculture and became known for his booming voice and pompous personal persona. But Karen Stade says the exhibition reveals the man behind the politician - a farmer and family man with a great wit and down-to-earth manner. "The politics of his time is fascinating - huge changes in New Zealand's agricultural dependence on the UK, the start of the anti-nuclear debate, our involvement in the Vietnam War, and a growing sense of national identity. But throughout all this, Sir Keith always identified with the common man. There are some lovely stories illustrating his great sense of humour and his great love of gardening," she says. Sir Keith's story is shown through a blend of text, photographs, memorabilia, and radio and television clips. Kiwi Keith, Portrait of a P.M. is open at the Nelson Provincial Museum until 3 November 2013.